Pinewood Estates is a gated community located in Woodbridge and is home to Vaughan&apos;s most expensive and iconic residences. The area is about one square kilometer in a country-like setting and borders the prestigious National Golf Course, which is considered by many to be the best golf course in Canada. With an exclusive collection of only 97 homes occupied by Vaughan&apos;s elite, many of the older properties have been torn down and replaced with brand new, custom-built estate homes, some valued up to an estimated $25,000,000. This suburban paradise has historically been elusive for buyers to acquire. We are pleased to present this rare opportunity to own an estate home in Vaughan&apos;s finest pocket. 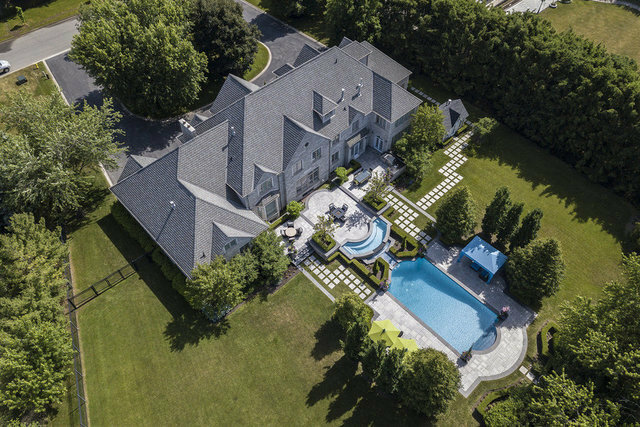 Fenyrose is a prestigious, private crescent in Pinewood Estates named by a prominent builder, musician and philanthropist in Vaughan after his beloved daughter. This most magnificent 5-bedroom residence is located the offers 138&apos; of premium frontage. The impeccable grounds on 1.21 acres have been recognized multiple times with landscaping awards of excellence and featured in multiple magazines. The home spans four levels and features over 13,200SF of finished living space. The main level features an in-law wing with separate entrances to the pool, front yard and private garage parking. The second level has five bedrooms with ensuite baths and includes the spacious master suite. The third level is a loft level, ideal for additional bedrooms, a children&apos;s playroom or an artist&apos;s studio. With the majestic proportions of a palace and an iconic neighborhood location, this home presents a golden opportunity for the discerning buyer to implement their design vision and transform this home into a signature space that will enhance one&apos;s lifestyle for years to come. Excellent private and public schools with shops, services and transit all in close proximity.